It’s been a few years since I’ve published a book (just over five) and it’s been since never that I’ve written a book for freelancers. In the summer of 2017 that will change. My next book, as yet untitled, is a collection of all of my magazine query letters that worked. No, I won’t just paste the letters in and send you on your way. I’ve been chronicling the stories behind each article. For every article I will share where I got the idea from, how I found my sources, how much I was paid, when I first pitched the article, when it was accepted, and when I was (finally) paid. I also share how my college years, work experience, and life events have shaped my freelance journey. If you have enjoyed my query letter that worked, and my other query that worked, then the book will be right up your alley. 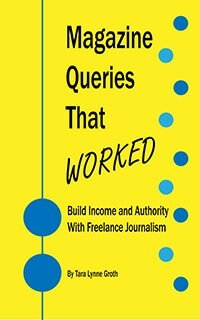 The book’s intro will be followed by advice on getting paid, query letter tips and mistakes, and ways to expedite one’s path toward freelance journalism. Nope. Nope. Nope. This is not a commercial. It’s a window into my current project. I shared details about the book with my newsletter subscribers months ago. Every month I’ve shared progress with them and how I’ve been using my author marketing toolkit (also forthcoming in 2017) to spread awareness about the book. If you’d like a peek at what’s happening before I post news here on the blog, subscribe to my monthly newsletter for writers. On rainy weekends I’ve spent full days at my kitchen table, surrounded by dozens of magazine clippings. A few afternoons have been spent at my favorite local coffee shops. I come home knowing what it must be like to smell like a barista, my hair and clothes reeking of coffee. I love it. While the interior of the book is nearly complete, the cover is next on my agenda. (Yes, like my last books, I’m designing the cover for this one too.) In the coming months I’ll have early renderings of potential covers, and I will ask your help in picking one when the time comes! Keep an eye on the social spheres; I’m using #querymagic to share more.